Crafted with loving care by yours truly, this is my collection of classroom surveys, printables, lesson and unit plans, activities, and other tools for your classroom. Most can be used in any subject or grade, including at the university level. If an item is exclusive to one particular age group or content area, that will be specified. All products are sold through my Teachers Pay Teachers store. Hover over each image below to see pricing information, and click on the image to go straight to the product page on TpT. Finally, something that helps you figure it all out! This 354-page digital binder sorts over 250 tech tools into easy-to-understand categories, helping you quickly learn what each one does and make decisions about what you need. 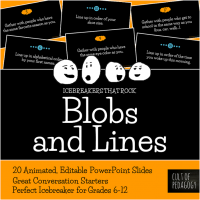 Includes links to each tool’s website and a short video demonstrating the tool in use. 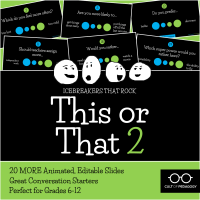 Student-created e-books offer so many possibilities for authentic demonstration of learning. 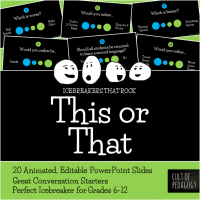 If you haven’t seen my post about all the things you can do with e-books, read it here, then come back and check out these fabulous templates! Get just one or save on the bundle that includes all six designs! 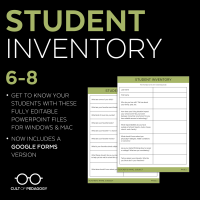 Each template includes versions for Windows, Mac, and Google Slides. Google Drive is so much more than an online filing cabinet. With its free built-in tools, you and your students can create word processing documents with Google Docs, slideshow presentations (like PowerPoints) with Google Slides, and online surveys with Google Forms. 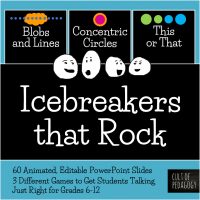 These video courses teach you and your students how to use them well. These lessons teach students the legal and ethical use of technology. 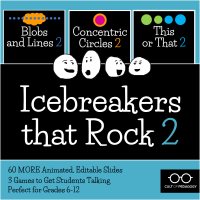 This collection of icebreakers will get students moving and talking, helping you build a community in your classroom and making students feel more at home. These surveys can be used at the beginning of the term when you are first getting to know students, to help you learn more about their learning preferences, hobbies, passions, responsibilities, and family life. Each level of form has been customized for that particular age group, and all forms are FULLY EDITABLE, so you can ask exactly the questions you want to ask. 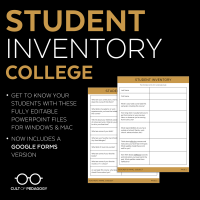 Once you have collected all that valuable student information, keep track of it with a 360 Spreadsheet. This allows you to continue building on your knowledge of students and have all the information on one convenient form. This lesson thoughtfully guides students to set measurable goals for the new year. 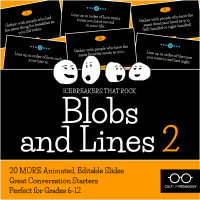 Includes two different kinds of goal-tracking charts and a follow-up reflection form. 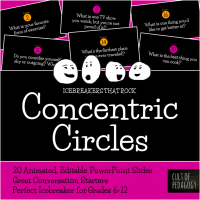 Available in printable form or an all-digital option for paperless classrooms! Give your students targeted, individual instruction in the specific grammar, spelling, and usage conventions they need to brush up on. 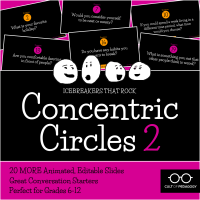 Use these to plan creative, engaging, rigorous instruction at all levels. For those smaller, repetitive tasks. Instead of grading every assignment individually, assess overall work habits by scoring work in batches with this holistic rubric. Teacher’s manual is included to explain the process. This category features two tools to reflect on your teaching practice: The Gut-Level Teacher Reflection is a 5-question exercise that helps you tap into your emotions and physical response to pinpoint exactly which areas of your practice you need to work on, then helps you develop an action plan for improving these areas. The “How’s It Going?” Forms allow you to find out exactly how students are experiencing your class at any time of year. It comes in two versions: Elementary is recommended for grades K-6, and Secondary/College is recommended for grades 6-12+.